If you want to know how to save for retirement but don’t know where to start it can be overwhelming. I know saving for retirement is a challenge when it’s 3-4 decades away, you have little money to invest or you simply don’t know how to invest in the stock market. I saw people deal with all of those issues when I was a stockbroker. I’ve also dealt with them myself in a previous life. Whatever the situation is, don’t allow them to hold you back from saving for retirement. 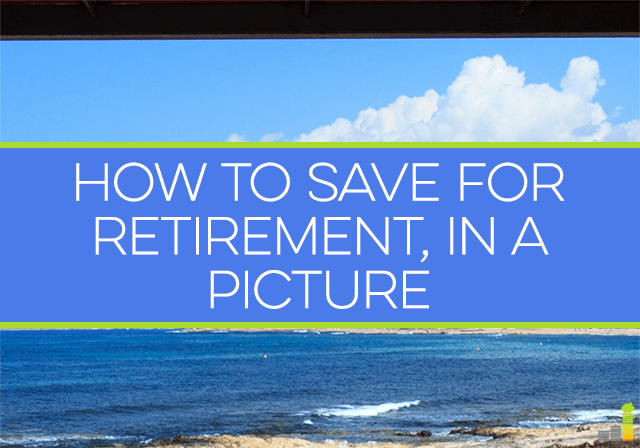 If you want to know how to save for retirement, this post will arm you with the information you need to start saving for retirement. I don’t know about you, but life is busy. This makes it easy to forget to do certain things and saving/investing is at the top of that list. A 401(k) plan is a great way to put saving for retirement on autopilot. You simply set it up to have a certain percentage out of each paycheck and they put it into your investments of choice. You don’t have to think about it, the automation does everything for you. Here’s how to set up your first 401(k) if you’ve never used one before and don’t know where to start. I love automation, but what I love even more is free money. Many employers will give you a 401(k) match for money you set aside for retirement. In many cases, it goes like this – you set aside six percent of your paycheck and they give you, for free, another three percent. Your plan may be a little different, but you get the point. Your employer gives you money, for free, to save for retirement. If you leave your job, don’t worry. You can take the money you’ve contributed into your 401(k) plan and move it to your new employer. You can also leave it with your old employer or move it to an online brokerage for an IRA. In some instances you may even be able to take the money your employer put in your account. Do you currently have a 401(k), but feel you might be able to do better? Blooom is a service that will analyze your plan to see if you’re overlooking lower cost or better performing funds within the plan. You know you need to save for retirement but what if your employer doesn’t offer a 401(k) plan? While over 80 percent of employers offer 401(k) plans, not everyone does. You may also have access to a 401(k) but the plan may not be very good. It’s really that simple. If you don’t have a 401(k) plan you need to find a way to save for retirement and that can be done through an online broker when you open an Individual Retirement Account (IRA). An online broker allows you to invest in virtually anything you want – stocks, mutual funds, Exchange-Traded Funds (ETFs) and more. Even if you don’t know how to invest in the stock market you can still do quite well through an online broker. Betterment: Betterment is a robo-advisor, which means they manage the entire investing process for you. You answer a few simple questions and they custom make a portfolio for you. The best part – Betterment has no minimum balance requirement. You can open an account with as little as you want. Ally Invest: Ally Invest is for more self-directed investors. Ally Invest has been around for years and offers many tools to help you save for retirement from over 8,000 mutual funds, an industry-low $4.95 per stock trade and a variety of other tools thanks to being a part of Ally Bank. You can open an IRA with Ally Invest with no minimum balance requirement. Saving for retirement without a 401(k) plan can be difficult though it’s certainly not impossible. If you do choose to open an IRA you can save up to $5,500 each year for your future retirement needs. I’ve been asked how to save for retirement many times. Regardless of where you’re at in your investing knowledge I commonly ask about goals. Your goals will dictate how you save for retirement. They will guide your decisions, your investments and much more. Let’s face it, we’re all different. You may want to pursue a traditional retirement. You may want to retire early. You may want to start a business in retirement. All of those will impact how and what you should invest in. If you don’t currently make enough to invest to make those goals possible, you want to find a way to make extra money. There are many ways to do that, from monetizing a skill to monetizing your down time. You can drive for Lyft in your free time (as one example), and they’re currently offering a $1,000 earnings guarantee in your first 30 days. You just need 125 rides in the first 30 days to reach the guarantee. You can set your own schedule and work whenever you wish. You can also monetize your down time, or make money while watching TV. I know debt seems odd in a talk of how to save for retirement. It’s really not and that’s for one simple reason – the more debt you have the less you’ll be able to save and invest. Debt obligates you to someone/something else and restricts your freedom. Too often, and I’ve been guilty of this myself in the past, I’ve seen people unable to save much for retirement and it almost always came down to one thing – they had too much debt. Get rid of your cable bill. Cutting the cord is one of the best ways to save money. You can try a no-contract option like Hulu with Live TV and save $60+ per month. Lower your debt payments. If you have a lot of consumer debt or student loans you can consolidate or refinance it to save money. There are many options available though Lightstream is great for consumer debt and Credible is great for student loans – the average Credible user saves almost $19,000 when they refinance their loans. Don’t eat out as much. The average person spends $225 per month eating out. If you cut that in half, you’ll have $1,350 to save for retirement in a year. There are many other simple ways to save money every month, but this should help you start saving money that can immediately be used for retirement planning. When many ask how to save for retirement they don’t realize how important time is in that question. We think it’s impossible to invest in the stock market with little money and choose not to start. Don’t give into the myth you need a lot of money to start saving for retirement. You don’t, you simply need to start. The reason is simple – time is your best friend when investing in the stock market. Even if it’s $50 or $100 a month, time will grow that money and cause it to make more money. It just builds on itself from there, but if you wait you lose out on all of that growth. Time also does something else with your retirement planning. As the stock market goes up and down some of your investments will do great and others not so great. You want to check in on your investments regularly. It doesn’t have to be on a specific interval, but you do want to check in on your investments. Many experts suggest to check in on your investments at least once per year. I usually recommend at least twice per year. Find what works for you and run with it. We’re not done with time and investing. The final aspect is your knowledge level. Education breeds confidence. That confidence gives birth to comfort. This will help your retirement planning efforts. You may not know much about investing in the stock market, and that’s ok.
Don’t think you can’t or shouldn’t invest as a result. There are many ways to learn how to invest – from resources available online to free classes offered through an online broker. You don’t need to be an expert to invest, you simply need to have a little knowledge and a willingness to start sooner rather than later. When did you start saving for retirement? Why is it so important to know how to save for retirement? How often do you check in on your investments? Nice infographic! For me, I’m just trying to get started. When you’re in your 20s it’s hard to think that far down the road. Thanks. I completely agree. That’s why starting small can be a great way to get started. Love the infographic! We are in primetime retirement saving mode right now. Whle we are investing, we are also saving in other ways, like real estate. BTW – We’d love to publish and nice infographic. How did you find that one? Thanks Greg. Great point, it can also be a great time to look at how you can diversify your saving/investing. I use http://visual.ly/ for my infographics. It’s totally free and they have a lot you can just pick from. You just put what you’re looking for in the search field and it brings up what they have. You can also input your own info to create on of your own. I have not gone that route yet, but do plan on it. Nice post. That infographic says it all. Sadly most people never get to plant that little seed to see their retirement investments blossom. I’m glad we started putting money into my wife’s 401k early. Wish we would have done more, but we’re going to ratchet it up this year. Thanks Justin. We’re in the same boat, but that can be changed. It’s important to learn from past mistakes and make impactful changes based off of what you’ve learned. Definitely start early! Even A little bit can add up to a lot in the end. Totally agree. Time is the most important component after the money you save. Thanks. I totally agree. Roth’s are pretty much my favorite as well. Saving for retirement is not only your retirement accounts, but also making sure your entire set of financial goals is accounted for when that time comes. For example, one of my goals is old-fashioned in that I do not want the mortgage or any debt to be in place when I retire, so this is a number that I take into account on top of the IRA and 401(k) numbers. Great point! I completely agree. I think retirement saving/investing requires a more holistic approach than just simply retirement accounts. great infographic. I love the images that depict all of the steps. Thanks. I liked how it made it so simple, yet so to the point. Great infograph! Roth IRAs and employer-sponsored plans are great vehicles to save for retirement. With most retired people that I speak with, the majority of them often say that they wished they would have started saving earlier and invested more throughout their lives. I hope the younger generations can learn from the mistakes of their parents and grandparents…time will tell! Thanks. I’ve seen the same thing as well. I have been encouraging my younger brother, who graduated college two years ago, to start putting money into a Roth now to get in that habit of saving money and getting it started sooner rather than later. Great analogy…..growing your savings. Cool. Thanks. That’s why I liked it, simple & to the point. Thanks. That exactly why I picked it. Nice infographic, easy and simple! I am totally hands on with my retirement, basically considering that any money “left for later” is a day less that I will have to work in my life! I love the little pictures. Doesn’t look scary at all. Maybe that should be what you get to sign up for a 401K instead of a book of big words and funds that intimidate most people. That’s a great idea Kim! I totally agree. That’s awesome Mr. CBB. I think saving for retirement is best served by attacking it from various angles to set yourself up best for it. I hope it gets easier, but I think a lot of it is what you make of it. Cute infographic! I wish I had started saving aggressively for retirement earlier. Thanks. I can relate, but that should just encourage us to do more of it now. I’m certainly guilty of not saving as much as I know would be optimal at my age, however, I do have several retirement investment vehicles at my disposal. Plus my employer puts 10% of my salary into a pension for me, to which I contribute another 6%. Overall, I probably contribute around 8% of my annual salary to my retirement. A very belated thank you for the link back to my post. I’m pretty sure there are no Hallmark cards for National Save for Retirement Week, but it is one of the more intelligent things to have come out of Congress. Love the info graphic one of the best I’ve seen. Not a problem Roger. I would agree with your comment on Congress. Unfortunately, I think most of their wisdom stops there.